There was no let up to the rain on Wednesday morning. My coat was still damp from the Tuesday walk, my gloves and hat still sopping wet. Luckily I have a selection of hats so I chose another but I don’t have a selection of gloves so I had to do without. If this rain keeps up I’m going to have to start a glove collection because my hands were freezing. The rain accompanied me all the way to work, huge drops churning up the water on the river as I passed. By the time I got to work my coat and hat were soaked again. It hardly stopped all day. We could hear it pounding against the building almost drowning out the sound of ringing phones. I’m beginning to think we’re going to have another wash out winter and spring complete with flooding. Personally I’d rather have crisp frosty mornings any day. Things looked promising when I looked out of the window on Thursday morning. There was the most beautiful pink sky behind the winter trees and an orange glow reflected in the windows of the houses behind ours. 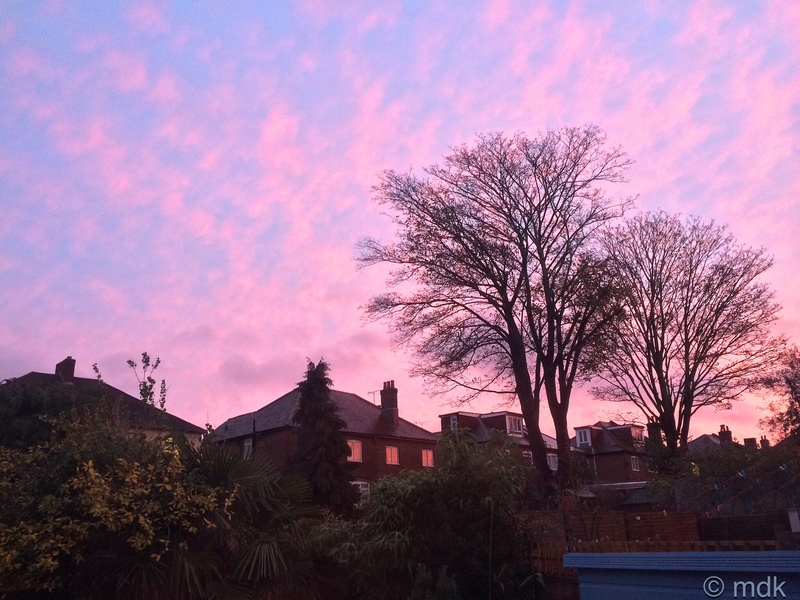 Of course I should have remembered the old rhyme, ‘red sky in the morning, shepherd’s warning.’ By the time I left the house the rain was back, not as heavy but still relentless. 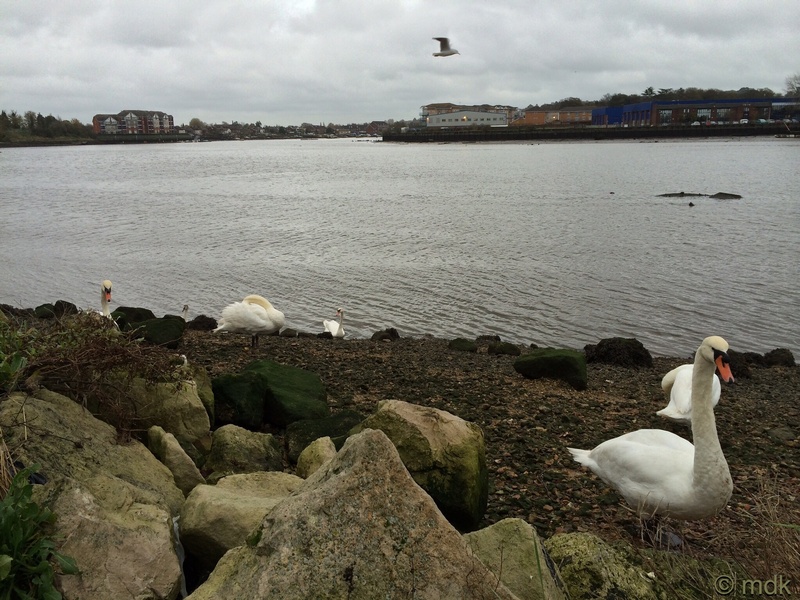 On the river I was greeted by a gaggle of swans, preening themselves on the bank. They looked at me expectantly and I got some hard stares when they realised I had no bread for them. Then Paddy and his master appeared and I walked along the boardwalk chatting while Paddy inspected every clump of grass. Sometimes I wish I had a dog to walk but, with Paddy, I’d never get very far he’s too interested in everything and everyone around him. The office was busy again. Roads had been closed in a certain city after a workmen fell off a roof. You’d think people would be understanding, and some were, but many weren’t. We all got shouted at a lot. When another accident later in the evening closed yet another main road in the same city the phones went mad. One lady said we should have someone on a bike going round all the bus stops explaining the problem to waiting passengers. Given there are many thousand stops in the city and the poor cyclist would also have to cope with the same traffic and road closures, not to mention the thirty eight sets of road works currently going on this would never work but who am I to argue? The rain was pounding on the decking when I ate my breakfast on Friday morning. 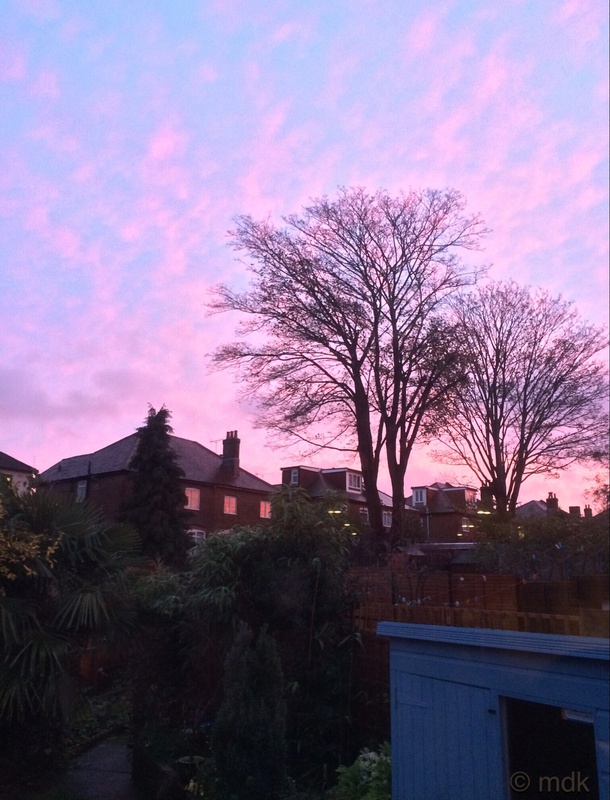 There were no pink sky false dawns outside, just darkness. The weather forecast, when I looked at it, had the day down as 100% chance of rain! Pretty emphatic then. It wasn’t wrong. The walk to work was soggy to say the least. 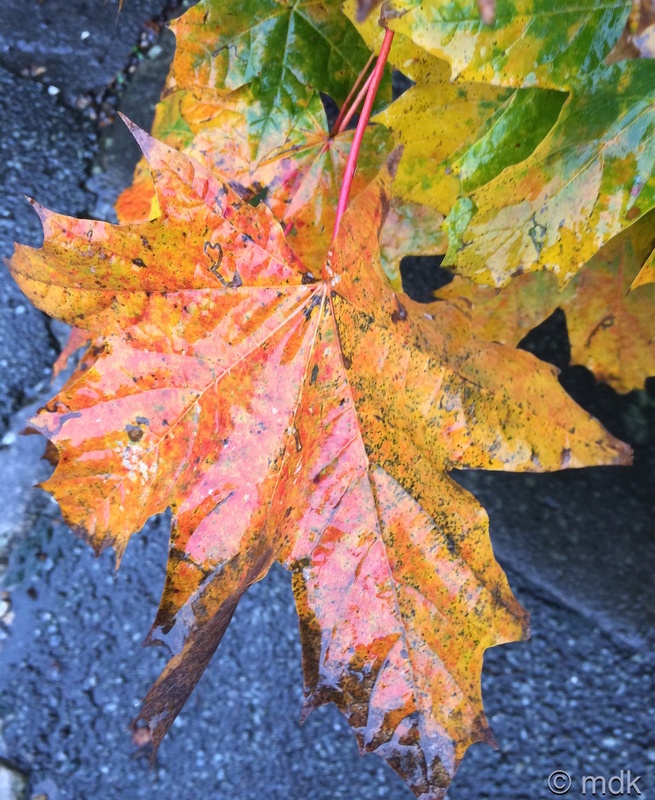 The only upside to all this rain as far as I can see is the way it makes all the colours seem so bright and fresh. When I left the house the garden positively glowed. 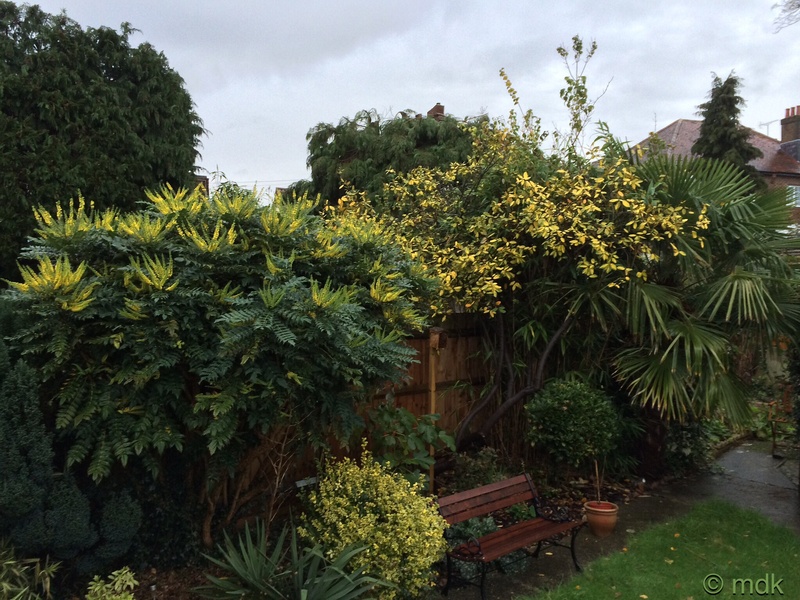 The bright flowers of the Mahonia are out now, echoing the yellow of the elaeagnus and privet leaves. 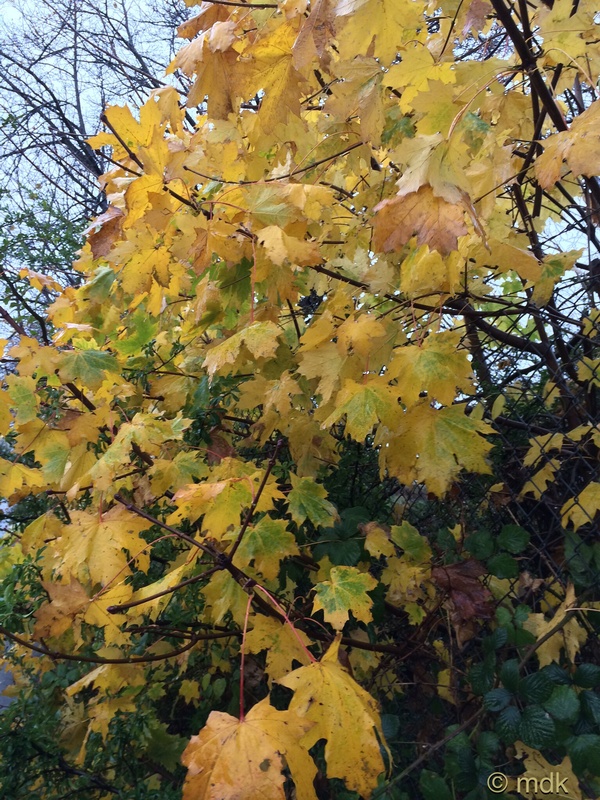 On Summer street the autumn leaves shone like a beacon. 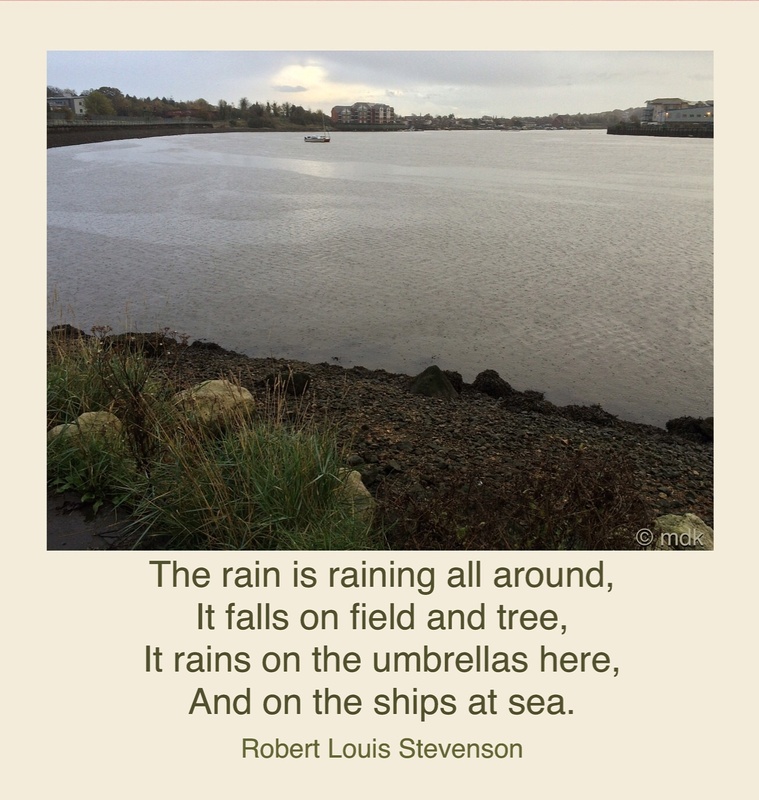 Little things to make me smile on a rainy walk. This was my last day at work this week, another reason to smile. In fact it was my last day at work until the Wednesday after next because my holiday has finally come. Of course this meant the day dragged by slower than a tortoise pulling a hay wagon. The email mountain seems to be growing ever bigger and it feels like we are constantly fire fighting but getting nowhere. The five past nine bus didn’t arrive until twenty past every single day, she said and it just wasn’t good ‘enuff.’ If you think I’m over egging the pudding with the spelling I promise you I’m not. There were two things that struck me as odd about her statement. First being most schools start at nine o’clock and secondly the bus is due at the stop she mentioned at three minutes past nine. The bus wasn’t late at all, the one she was catching was the next one, due at twenty three minutes past nine. Obviously reading a timetable is not her strong point. I’m not sure she’s going to like my reply but I did stop short of telling her she should get out of bed earlier and catch the eight forty three bus. Eventually the day crawled to a close and it was time to go home. All the angry calls and badly spelled emails are behind me for over a week and I can relax, go for walks and enjoy myself. There is also a little trip through the Channel Tunnel to Paris. It’s not until later in the week and I’ll tell you more soon I promise. I’m pretty sure the week off is going to fly by far faster than that last day at work. Dunt no wat yur on abowt Marie cos I cant sea any speling mistaks in thows bits. Enjoy the time off! I hope the weather cooperates. Thanks. I’m pretty sure it’s going to be rainy but I’m going to get out as much as I can anyway. Oh dear. So pleased you didn’t live in Brisbane the other day when they shut down the train system due to a huge storm and the buses couldn’t keep up with the overflow. There always seems to be something going on in the South of England that disrupts the buses and people always seem surprised.